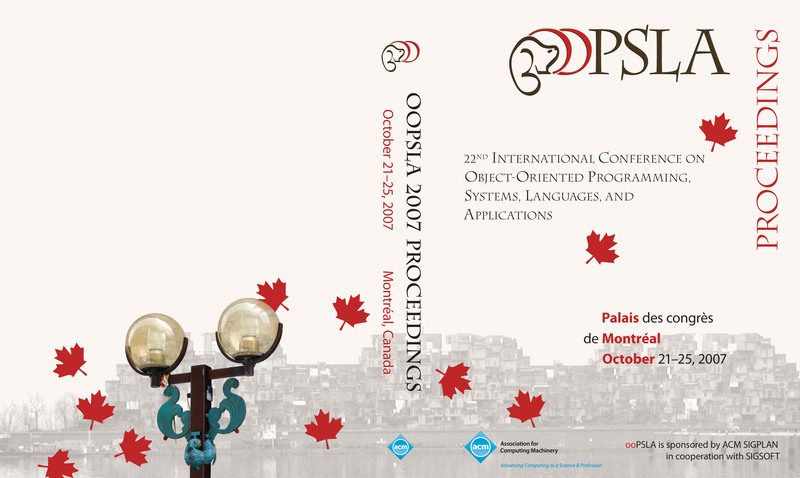 This year ooPSLA is in Montréal. Before going to the first organizing meeting there in early December 2006, I hadn’t been there since I was a kid. In fact, that was in 1967 when the Expo was there. If you have suggestions for this guide, please email me (chair at oopsla dot org). Fancy Proceedings Cover - the one you got at ooPSLA, not the one SIGPLAN sent to you. Here is an overall map that shows the airport and convention center, the Palais des congrès de Montreal. There are buses, but I took a cab, which is a fixed price of 35$ (which is how I’ll write Canadian dollars) from the airport to Old Montréal, which is where the conference is. It takes about 30 minutes, but it could be more with traffic. I'd've included the Aerobus (since some ppl are students and won't want to pay the 35$ canadian). Here is a more detailed map of the Palais and surrounding areas. The Palais des congrès has a major road / highway that goes under it. There is also a Metro station (the PLACE-D’ARMES station) under it so you can get around Montréal easily. Old Montréal is where you’ll find shops and good restaurants. Chinatown is really located mostly on the Rue de la Gauchetiére Oest and Rue Clark. Let’s zoom in a little closer. The Palais is brightly colored. The other thing to notice about this picturetaken in early December 2006is that it is raining. It might very well rain during ooPSLA, so you should come prepared for wet and cold. Or it could be beautiful with unbelievable folliage. But, because Montréal is a cold-weather city, it has an extensive underground passageway system! So it’s possible to go from the hotel to the Palais without going outside at all. It’s a little complicated. From the hotel lobby, go down the very short stairs to the bar area. Just to your left and behind you will be some elevators. Take one to, I think, level P3. You should come out in front of a gazebo. If you keep your right hand on the wall and walk into the complicated looking underground shopping center, you will eventually see signs for the Palais des congrès and the metro station. Follow the signs. Here are Martin Robillard's extraordinary instructions for this path. Here is a diagram. If you follow the black path the whole way, you’ll never go outside. The red path is a cutoff that goes across a street and small plaza into the main entrance to the Palais. The inside way ends up in the same place. Once inside, you’ll see a set of stairs and escalators that go up the the 5th floor. That’s where ooPSLA is. Here is a pdf with more of the underground system in this area. These are not the escalators you'll go up (probably)these are at one end of the conference center and the main ones are in the center. But, like these, the ones you'll take ascend / descend 2 levels. The large rooms for Onward!, Research papers, and the Courtyard are straight ahead from the (real) escalators, and registration will be to the left. This photo is useful for showing some of the colors you'll see there.